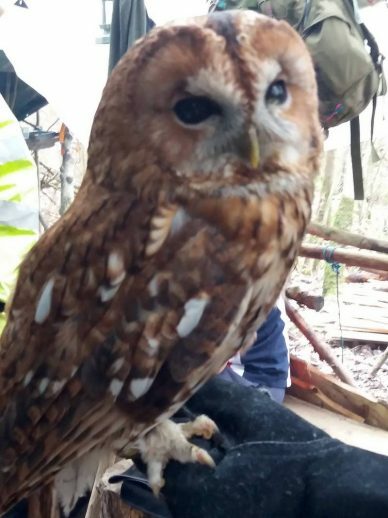 This course is a must for all those starting out in their woods and for those that want to learn how to manage and maintain it while ensuring that the wildlife is encouraged, too. The course was full, that says something straight away, but with just six attendees, we found that we were able to learn skills without being left alone in the crowds! We started with a walk around some of the 50 acres of woodland at Ravenshill Woodland Reserve, while learning how to identify trees in winter. And to the business of coppicing – we learnt how to choose a site to coppice, with details about compartments, coupes and coppice rotation. How to arrange stacks of produce such as pea sticks / bean poles / steaks/ hedge posts –the list is endless. We built the stacks which then gave us ample opportunity to identify the species and stack them into piles of hazel / ash / oak or whatever. 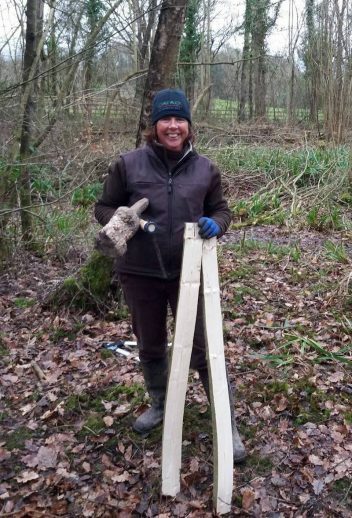 Phil supplied all the tools and I had great fun with the froe while splitting posts. We coppiced complete stools and created windrows for insects and birds. We layered the hazel that we hadn’t coppiced to create more stools throughout the compartment that was looking a little bare. 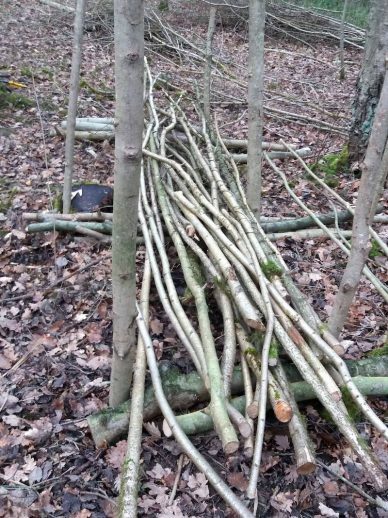 We made pegs to hold the layered hazel in place and then selected hawthorn to protect the growth. We had a great time and have come away from the course with a re-kindled enthusiasm to get coppicing on our own woodland. I now look at coppiced wood in a totally new light: I understand why you coppice, the financial gains (if that’s what you’re interested in) and the benefits for your woodland and the habitat. We had lunch, cooked by Rae Wood – hot piping soup and pheasant casserole – all tea and biscuits and fruit included in the price and Rae even gave me some private tuition on traditional Split Peg making using a willow kosht. We also met Nelson the Tawny Owl , who has been rescued and lives on site. You can stay on site – we didn’t camp as it was cold wet and storm Doris was still blowing. We did stay on site in our motorhome with the kind permission of the local woodland owners.